Mastering the Art of Marketing is a compilation of marketing and design strategies your small business can implement right away. Explore the workbook on your own or with your team. 5 step master plan for your Small Business marketing – Production, brand manufacturing, service firms, wholesale e-commerce businesses, brick and mortar retail, local bars and restaurants, increase growth opportunity when you have a plan. Master the Art of Marketing e-workbook is a 12 step monthly marketing for small business strategy. Start each year with all the information you need to get the small business marketing results you want. The exercises in this marketing e-book have been laid out in the form of a calendar year. We chose this formatting so small businesses or solo-preneurs with limited staff and time may be able to take on business branding and marketing in bite size chunks. We don’t want you to feel overwhelmed and abandon the effort part way through by attempting to complete it all in one day! We also recognize entrepreneurs are a different breed of animal – which is why we love working with growing small businesses – our jobs are NEVER boring! Because of the unique personality traits and individual style of each business owner we also recognize some of you are not going to follow a designated path. We encourage you to skip around this marketing book and choose the practices that are most important to your small business right now. All of the worksheets relate to marketing for small business, branding and advertising for business growth. There is no set order in which you must follow. Some of you may choose to begin at the end with the worksheet on branding. If you have not already defined your brand promise, I would encourage you to do so. Our hope is that this marketing ebook will help you to begin each new year with goals and plans in place to build your business by delivering the very best product and service in the way your ideal customers want to receive it. Whether you choose to take it all on at once and begin the new year with plans in place or whether you choose to tackle a worksheet each month throughout each year, it is up to you. We have designed the content so you may use this marketing ebook for small business for years to come. Social media platforms and resource links may change but the essence of mastering your marketing for small business will remain the same. If you find some of the tasks to be burdensome or difficult to complete, please contact us. 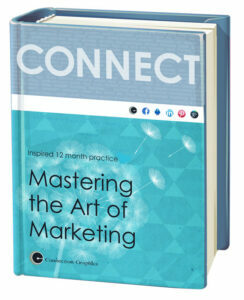 Connection Group provides all of the services contained in this marketing ebook. If you are part way through and just need a nudge of support or if you have decided your efforts are best directed to run your company, give us a call. Outsourcing the tasks of marketing for small business and all the items involved may be a smarter use of your energy, connect with us today. Connection Group can help you with your corporate branding, graphic design, marketing, web design, and web maintenance. Download today and attract what you desire for your business this year. Be inspired to create relevant marketing for small business that will captivate your ideal customers. All of the best to you as you move forward with the process of your small business marketing.